In the town of Biella, Italy, a small fragrance company called Acqua di Biella has been making its mark since 1871. The original fragrances were based on "formulas originating from local convents" and today they have four fragrances: No. 1, Baraja, Janca and Bursch. No. 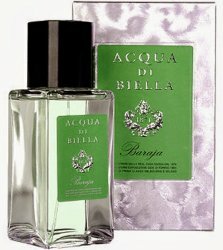 1: An old-world scent with the perfect vintage appeal, Acqua di Biella’s first creation, No. 1, is a bewitching blend of petitgrain, neroli, jasmine, rosemary, lavender, bergamot, mint, and musk. At first sniff, I felt as though I was smelling something familiar. The olfactory notes are quite common in many traditional Eaux de Cologne and soaps, so I just chalked it up to tradition. The scent opens with petitgrain and neroli set against a soft lavender. Mint quickly arrives with an herbal rosemary. The jasmine is quite subtle, creating a soft creaminess that blends well with the lavender and fills in the background of the scent. The musk is merely an anchor that adds a little warmth. After about 15 minutes the entire composition blends and begins to settle. Like Baraja (see below), No. 1 has a clean and fresh feel, but because it’s an Eau de Cologne, little projection or longevity. I’m reminded of classic British soap like Bronnley’s English Fern (it’s the mint and lavender) and I like the nostalgic feel the scent creates. Overall, the fragrance reminds me of Acqua di Parma, but without the floral notes and woods, and slightly more herbal. I prefer the citrusy Baraja, but wouldn’t mind splashing on a little No. 1 on a hot summer’s day. Baraja: The scent of the summer Tide — no not the ocean, silly…Tide laundry detergent! Yes, with notes of lemon, citron, lime, cinnamon, cardamon, nutmeg, iris, pittosporum, vetiver, patchouli, and ambergris, Baraja is snuggly and clean, fresh and light, and won’t clash with your freshly washed favorite tee! Baraja opens with a blast of citrus, and it’s a winner; a subtle lime and citron that quickly blends into the middle and base notes that are so well-blended it’s quite difficult to pick them out individually. The scent does very little changing after the first few minutes and does not project much. The best words I can come up with are “sparkling”, “calming”, “smooth”, and “celadon”…why celadon? Well, the scent reminds me of that super-thin translucent china in a light sage color. For comparison’s sake, I’ll offer that Baraja reminds me of Gendarme minus the musks or Castelbajac minus the almond. At the standard price of $110 for 100 ml, I’m not sure I’ll be ordering a bottle anytime soon, but my eyes will be peeled for decants. Marlen, I've noticed these on LuckyScent, and wondered about them…but I must admit I'm always a little offput by the plainness of the bottles! Which may just be a trick of the image, and certainly shows me up as the shallow person I fear I am…but the juice would have to be sensational to make up for the plain bottles and black cap. Has anyone got a bottle? Is it nicer than it looks? N, sure Marlen will be along to answer you, but am butting in anyway just to say that I have seen the bottles at Tak, and they are pretty much what you see in the picture. Not ugly really, just rather minimalist, and not something you'd buy for the bottle, that is for sure. We left the heat running in the office all night. It is 87 degrees in here and suddenly anything light, fresh and eau-de-cologne-like sounds incredibly appealing I also wonder what Bursch is like. That sounds so pleasantly similar to Borscht. Colombina – LOL!!! I was thinking bursitis myself and the name made me think of swollen joints. Great reviews! I think that these are very nice, but yes, if you are looking for drama, these fragrances will not provide it. I liked them, but did not find them necessary. Remember back in the 80s (well, I don't, not really no, I was just a little kid) when they had the “If you like X, you'll love Y” cheap immitation line that came in a metal cannister? We need to get that movement revived, at least on this forum. Because you know I'm just not going to fork over 110 smackeroos to smell like hostel soap, I mean, European soap. Something like,”if you like Bond No. 9 Fashion Avenue, you might be able to live with write-in-your-fav-less-pocketbook-denting-scent”. I'm also groveling for a thread about non-perfume products that smell yummy delicious; currently I'm in love with Decleor Nutri-Delice cream, Frederick Fekkai body cream, and that nice bedsy smell that's always in the Clarins bottles and jars. Am I a tool of the cosmetic industry for being bewitched by the smell to buy the product? Thanks for the review on Baraja, M! I actually wore this yesterday. I needed a Spring-type burst, something fresh, something lighter than the woodsy and incensy things I've been wearing lately. I think both my husband and I could wear this scent. Lime in a fragrance is not very appealing to me, but it's fleeting. I'll be reaching for Baraja more often when the weather turns hot. If it ever does.